On February 4, 2009, the music world lost vocalist Lux Interior of The Cramps. It was a heavy blow to the underground punk rock and alternative scene. The Cramps were one of the originators of the psychobilly punk movement and to this day continue to influence punks worldwide. While The Cramps are definitely one of a kind, Dallas’s own, The Gorehounds, are arguably one of the best Cramps cover bands out there. 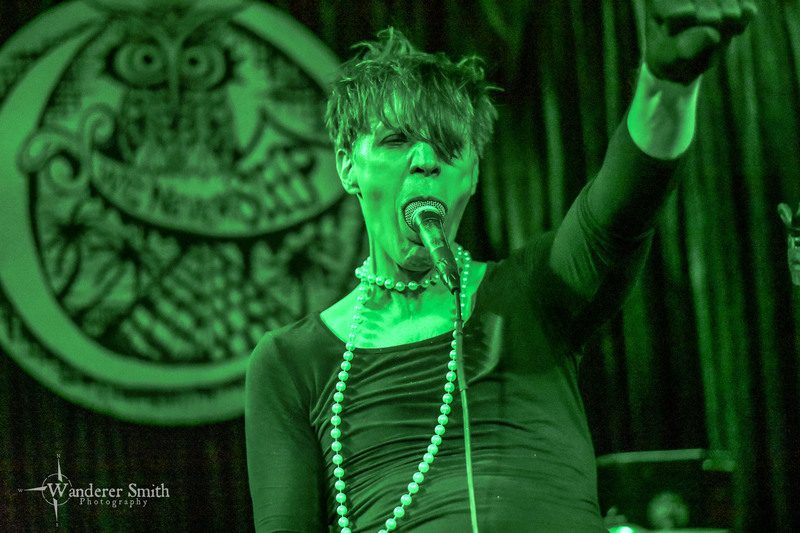 On Saturday night, The Gorehounds took over Three Links in Deep Ellum for a night of celebrating The Cramps’ music and the life of Lux Interior on the 10-year anniversary of his death. The Gorehounds don’t play often, but when they do there are a couple of things that I can assure you: it will be a packed house and an amazing night. Three Links was overflowing with an eclectic crowd. A Gorehounds show is a place where you can absolutely be yourself and be surrounded by others without fear of being judged. Regardless of gender, race, sexual orientation, or age, both the band and the fans seemed like one big family. It was a beautiful sight to see. Just after midnight, the lights dimmed and The Gorehounds took the stage. The set kicked off with tracks “Thee Most Exalted Potentate of Love” from The Cramps 1983 release Smell of Female, and “Let’s Get Fucked Up” from their 1994 release, Flamejob. Not only do The Gorehounds sound exactly like The Cramps, they look the part as well. Vocalist Howard Kelley hit every note with ease and was a spitting image of Lux Interior, all the way down to the high heels. Guitarist JT Dayton took on the role of playing The Cramps’ guitarist Poison Ivy, complete with teased hair, make-up, and fishnets. Bassist Spyche Bonjiovi laid down the bass lines while drummer Clint Phillips provided the beats on a true punk style, 4-piece Ludwig drum kit. Honey Hula-la Performs w/ The Gorehounds @ Three Links. Photo by Corey Smith. The crowd danced the night away as the band charged forward with tracks “Can’t Find My Mind” and “Goo Goo Muck,” both tracks from The Cramps’ 1981 release Psychedelic Jungle. Not a single fan was standing still near the front of the stage as they twisted about and sang along. But remember, if you aren’t respecting the space of those around you, vocalists Howard Kelley will call you out and have you escorted out of the building. Kelley demonstrated that when a fan near the stage was ruining the show for others by trying to charge forward, spilling drinks, and all around acting-a-fool. An appreciative applause filled the air as the unwanted fan left the building. Without missing a beat, everyone went back to enjoying the show in peace. Also, what psychobilly punk show would be complete without beautiful pin-up burlesque performers on stage throughout the night? No need to fear, The Gorehounds had that covered as well. Two of Dallas’s best burlesque performers, Courtney Crave and Honey Hula-la, entertained the crowd with mesmerizing performances and costume changes throughout the set. From red lace and devil horns, to pin-up fashion and leopard print, the performers had the crowd fixated on their routines. The Gorehounds played through a wide range of songs that spanned The Cramps’ discography and even included an encore! Whether you’ve been a fan of The Cramps for years or don’t have a clue who they are, if you get the opportunity to see The Gorehounds, do it. This was an amazing show and I’ll see them live any chance I get. The Gorehounds @ Three Links. Photo by Corey Smith. We drove over from Monroe, La for the show…life-long Cramps fan! Great night!! We’ll be back for Halloween! !